A Painting Today: "100 Faces, No. 38"
Something came over me with this one - I painted slower than usual. 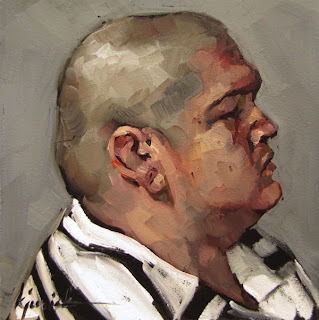 There was more bone and skin to explore, wonderful grey tones hidden in the reds of the skin - the more I painted, the more dignified the subject became. One of my personal favorites. Oh my, Karin, this is the best yet. Love it. The colors are beautiful. Can't wait to take your class. I am exploring repetition. Do you think that after painting a head 38 times your ability to see has changed? I am glad you love this one. You should. Repetition is practice - and hopefully there's improvement with practice, in everything we do. I think my ability to invent more color and interest from a dull, small photo has been the big lesson learned - which is why every painting is a conquest. This went to the top of the fave list!